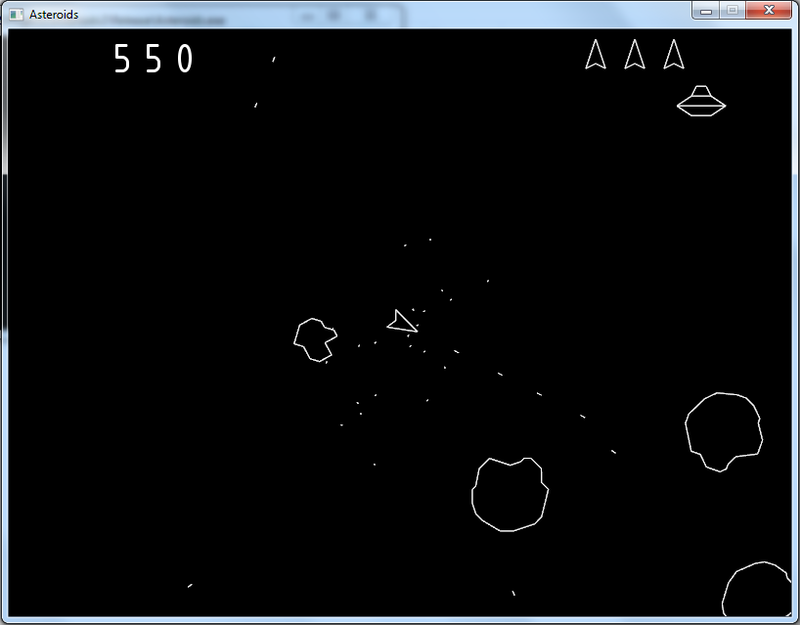 The next game in my continued endeavor to learn C++ was Asteroids. I intentionally picked something about an order magnitude more complicated than my previous project, Pong, but wanted to still stay relatively simple. Asteroids is, simply put, a top-down 2D ship shooter with a wraparound play-field where you try last as long as possible. It is a pretty well-known game from back in the day and I didn't think it would be all that hard to make. Because each of these were abstracted out I was able to (debatably) decrease the size of my object tree hierarchy. Since Asteroids is such a simple game it probably didn't save me much here, but I wanted to test it out since I will only be making more complicated games in the future. This ended up working well enough for me here, and I think I will stick to it in the future. I would like to add that Mike Geig's Object Oriented Game Development series helped out immensely in my understanding of C++ and how to deal with larger projects, and especially with how to work with iterators. Asteroids source code is available here. Asteroids as an executable + resources is available here. To run it, rename the ".rename" extension to ".exe". Controls are either arrow keys or ASDW and the spacebar. The high score screen is a bit tricky to navigate around in. Use left / right arrow to change your cursor position and up/down arrow to change the lettering. Navigate all the way to the right and hit enter to commit & exit.